Grief is a very personal experience. To me, grief felt like someone plucked away very vital pieces of my life and dared me to continue living without them. It felt like a cruel joke… a scary dream I badly wanted to wake up from. An impossible riddle I felt compelled to solve but had no clue where to start! The longing was almost physically painful. The most unlikely things would knock me off the ground. The crushing sense of being alone – even when surrounded by people – often took me by surprise. And the tears and sobs that I started hiding, because…no one seemed to get it! It’s not like they didn’t try, but no matter what anyone said or did, my mind went: you don’t get it, do you? Perhaps you can relate to how I felt. Or maybe you have read a book or article that mirrored how you felt. However, it is more likely that your experience was quite different from mine or anyone else’s. People mourn loss in their own unique way. Which is why it can often seem like no one else understands. Whether you are grieving the death of a parent, a child, a sibling, partner, grandparent, friend or pet - no one knew them the way you did. The relationship you shared with them was unlike their relationship with anyone else. So it is natural that no one else feels the loss in the exact same way that you do. And that’s OK. It does not mean another person’s pain is any less or more than yours. Respect the fact that this is a personal and individual response. Losing a loved one stirs up many emotions and sadness is one of them. However, you can also feel a host of other things – anger, guilt, loneliness, resentment, anxiety, confusion or even numbness. You might find yourself pining for your loved one or feel anxious doing things you used to do together. Allow yourself to feel. Healing through the loss is a process but not a linear one. 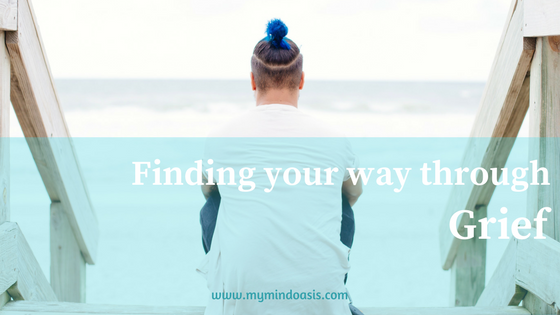 Coping with the death of a loved one means learning to live without them…learning to change or let go of joint plans…learning to reorganize your life. It is often a daunting task and takes time. You may find yourself going through intense emotions and periods of relative calm. Grief rarely (if ever!) follows a linear path. It is more like a squiggly line that goes up and down, backwards and forwards, runs straight and gets tangled up again – sometimes many times over. There are ups and downs – one day you seem to see the light and the next you are plunged into a dark pit, struggling to claw your way out. In the midst of emotional times, remind yourself that there is not a ‘correct way’ of how you should be feeling or reacting. The truth about mourning a loss is that there is no right way of doing it. Despite countless books and articles telling you ‘how to’, your grief is your own. It is unique. This is at once daunting and liberating – because no one can tell you what’s right for you. And daunting for the same reason – you don’t know what to expect. So I am not going to tell you how to grieve. Instead, I will tell you this: You learn to grieve every time you lose someone you love because every time is new. Grief cannot – and should not – be rushed. You can’t set a time limit on your feelings. As long as you are not at risk of hurting yourself or another person, there is no ‘wrong’ way either. Often, the intensity of your feelings reduces over time. However, it is not unusual for the return of intense feelings, especially around anniversaries, birthdays and holidays. It is OK to admit that you are struggling with grief months or even years after the loss. Don’t shut yourself off from the people around you. I don’t understand grief. Over the years, I have come to understand my grief (at least to some extent), but I can’t claim to understand yours. Not unless you choose to share it with me. It’s the same for the people in your life. They don’t get it, but that doesn’t mean they can’t support you in your journey. Sharing can help reduce the sense of loneliness and isolation. Sometimes, people suppress their true feelings to avoid conversation or out of fear of upsetting others. Suppressing your grief can increase susceptibility to depression, illness and addictions (Parkes, 1998). If you are struggling to cope with the death of a loved one, there are a number of resources available to help you through your grief. It might seem impossible initially, but a large number of people manage to cope with the pain and loss – often with the help of friends and family. Don’t be embarrassed to ask for help. The initial months can be really difficult, however, if you find yourself struggling with daily tasks even after, you might find it useful to speak to a counsellor or join a support group. Counselling can be particularly helpful in accepting the reality of the loss, getting in touch with your feelings and learning healthy ways of remembering and communicating about the deceased. Some people find it useful to connect with others who have been through similar experiences. Meditation and mindful relaxation can also be helpful for some. Explore what works for you and give yourself the permission to heal. I would be happy to hear from you if you have any questions, and you are welcome to get in touch.